So it's less Upotte and more So Ra no Wo To. Which is still a pretty big compliment to be paid in terms of things to be compared to. Hmm ... well, that's a little better I guess. Maybe I will just prick my ears up on this one then. 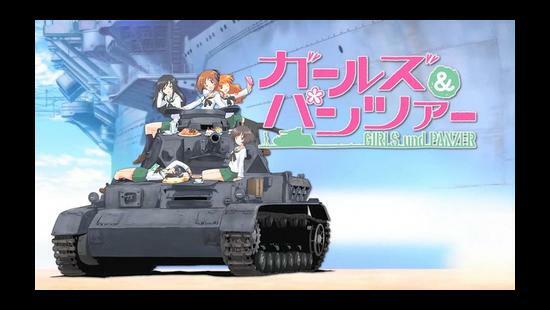 Or Pantsu on a Panzer? Ok now where is the Tron? Bah, it's moe schoolgirls complete with shining eyes instead of anthropomorphized tanks. If it's anything like Sora no Woto (painfully boring to me) I'll pass. Well, we've had guns, now comes tanks. Planes and subs are the obvious next step, unless you want to go with ballistic missiles. I think Strike Witches would be our "planes"(altho persoanlly would like to see another different take on planes and with modern day planes) and there is a manga series that deals with Naval warfare, altho slightly more mature than what we usually get. You know whats a pity here is the main character designs are bland and well pretty generic, I would have much prefered some of the girls in the uniforms that were lined up at the start of the PV. They were all alot better looking and more diverse in character design compared to what we got. I feel like getting the models of the tanks now, haven't actually got any WWII tank models yet. Oddly enough depsite love for WWII stuff, the models never tickled my fancy. People who talk about a new Sengoku genderbent anime is worse than the girls' military animes like this. This show makes no sense, I mean, you don't just find old tanks lying around waiting to be fixed. And secondly, how expensive are those parts going to be? Or how about the fuel. Tanks make cars look cheap. Possible that the school was a tank storage or something, or the tank was a gift from a sister school before/during WW2. And secondly, how expensive are those parts going to be? Custom manufacturing is possible. Relatively expensive, but still possible given Japan's talent for getting the craziest parts made. Or how about the fuel. Tanks make cars look cheap. The Panzerkampfwagen Tiger Ausf. E consumed 7.82 liters per km, which would be around 1195 yen per km, so $10 per km. It's not that expensive. the Title alone caught my eye, I shall be keeping an eye on this one. That said what about insurance? So, I got introduced to this series by a tank nut. Will be hanging around still. Setting up anti-Saintess traps and counterTRONmeasures. Latter might not be necessary given the lack of milksacks so far. And on the Original Character front, I sense that this series might inspire a new resurgence. Time to dust off the Senjou no Valkyja girls. I know now why Hitler desperately need those oil fields for his numerous tanks back then. Back again.. Will their school fund for such a project?? Funny how this did remind me of Valkyria Chronicles. Tempted to play 1 again (for the 4th time) Its sitting right there on the side of my desk. I'll definitely be looking forward to this one. School girls? WWII era tanks? What could possibly go wrong? Interesting, because have an old model of this tank. Panzer grey too. Is that an aircraft carrier in the background? For real, you know what this show needs? A KV-2, that would be hilarious. Boredom. Failure to use the gimmick to any sort of effect and instead falling back on the whole cute girls doing the same old cute things concept we see 10's of times each year. The usual pitfalls. Seriously you have no idea how many times I've looked at one of these and said, "hey this might be fun for the novelty and there's even the potential for some action and drama" only to find out no there isn't, all there's room for is light hearted inanity and stock scenarios. This look interesting, I wonder if it's going to be like Sora no Woto? It better not be... I'd want something to happen! The title is particularly weird. Why not go all the way and make it all German, "like "Mädchen und Panzer"? Anyway, chara design doesn't look too inspiring. Hope it doesn't become a lame Sora no Woto.